After Apple announced their sixth-generation iPad today–which brings the A10 Fusion processor and support for Apple Pencil–the company has dropped the price of its refurbished 2017 iPad. Right now, last year’s iPad which has the A9 chip, is available on Apple.ca for $319 for the entry 32GB Wi-Fi model, a price reduction of $60 compared to last November, when these models first hit the refurb store at $379. This new price is cheaper than a refurb iPad Air 2 16GB model (2014 + A8X), which is currently listed for $349. 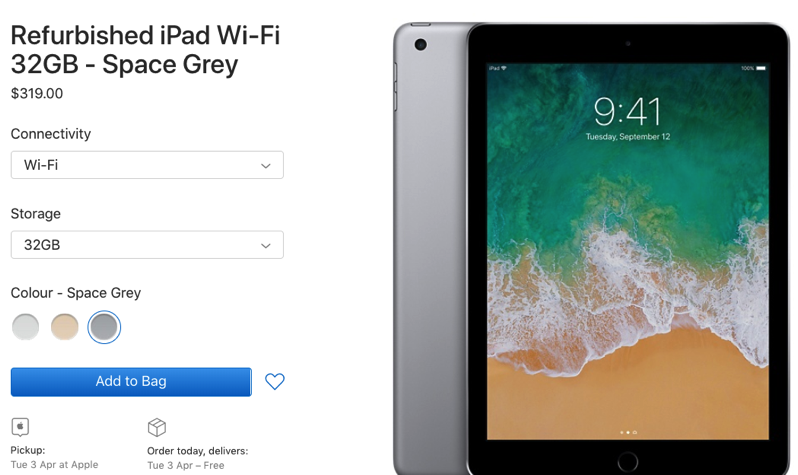 At $319 CAD for a 32GB refurbished 2017 iPad, it is priced below the Walmart Black Friday deal, when we saw the latter model drop to $348. Refurbished iPads come with a new exterior shell and battery, one-year warranty, and are good as new, minus original retail packaging. Apple’s 2018 iPad announced today starts at $429 CAD, a price drop of $20 compared to the $449 price of last year’s 2017 model. If you can live without A10 Fusion and Apple Pencil support, you can get some decent deals on last year’s iPad, which is still more than capable (for now). Let us know what you’re going to pick up! Click here to read all the articles from Apple’s special event in Chicago today.